prime fillet steak served on bed of crouton with homemade pate' & a red wne sauce. 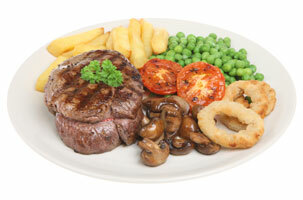 Our Prime quality steaks are served with onion rings, sautèed mushrooms, your choice of potatoes and a selection of vegetables. chips are hand cut. Compliment your meal, Pepper, stilton and Diane Sauces are also available.